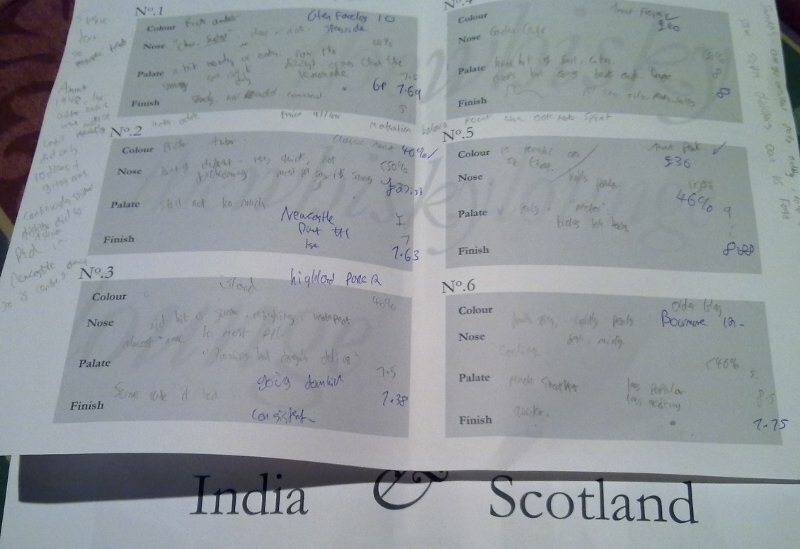 This Tuesday past was the latest Whisky Lounge in York, the second leg of the India Vs Scotland tour. The Indian malt whisky was all produced by Amrut (I won’t link to their site, Google reckons it’s harmful) Distilleries, who have three main and distinctive expressions released in the UK at the moment, all available at bottle (40-50%) and cask strength (> 61%). Eddie did as good a job as usual matching them up to three Scottish whiskys, to make sure we were comparing like with like. I don’t think I’ve actually written up a Whisky Lounge Tasting before, so I’ll go through the format in a bit of detail. I would say I’d make careful reference to my notes from the evening, but apart from names and numbers, I can’t make head nor tail of my scribblings. You’d think my handwriting was already as unintelligible as it’s possible to get, but just wait until 6 stiff doubles have cast their votes too.. This was a fairly select gathering, half-term was working against us, so Eddie had about a dozen pupils for this round of head-to-head tastings. It started off with a lot of background on what was in front of us and what we’re hoping to achieve. Eddie knows Ashok Chokalinga, Amrut’s brand ambassador, pretty well and has absorbed enough about the company and its history to recount it with authority. The banter is interspersed with bits of history, tales of some unique malts that people had been able to get their hands on, discussions of how the festival (rub it in why don’t ye) went etc. Hopefully the festival will have two sessions next year, which should help matters along somewhat. The key characteristic of Amrut’s whisky is the accelerated maturation associated with India’s hotter climate than, say, Scotland’s west coast. It doesn’t need a formal age statement because a number of people will, rightly or wrongly, severely mark down the whisky because it’s, say, only 6 years old. The angel’s share is going to be pretty impressive too, so I’d guess it’s a commercial decision as well as a quality one. Regardless, if you left a single malt spirit in a barrel in their warehouses for 15 to 18 years, I doubt there’ll be too much left in the bottom apart from the strongest, most tanniny oak liqueur imaginable. Back to the tasting. The whiskies are presented anonymously in 6 numbered glasses. Eddie always puts them in a sensible order to build up your palette as gradually as possible, it takes over an hour for your nose to recover sensitivity from a full ‘hit’ of whisky, so the most flavoursome tend to arrive at the end. We’re led through the various stages of Tasting a whisky, spending most of the effort on the nose, trying to tease out all the different layers of the scent by holding the glass increasingly closer to your nose whilst smelling. If you just stuck your nose into the glass of a heavily peated, cask strength whisky, you wouldn’t be smelling anything else all evening (but why would you want to?). The scoring is done on the Eddie scale from 6 to 10 in steps of 0.5. A whisky gets 6 for just showing up and you’re unlikely to ever meet a 10. It’s entirely personal and unscientific, but it does allow regional averages to be compared because there are some very strong geographic trends for people’s whisky taste preferences around the UK. I’ve already mentioned that my sense of smell is a bit broken, so the scenes and flavours my memory throws up to match a scent aren’t necessarily what the rest of the world would. The colours were all very similar, so it’s not worth noting those this time around. Also, as I started to enjoy the whisky more, my notes became noticably more, err, absent,so without much further ado, these are the 6 whiskies, presented in order but with the answers matched in. 2. Classic Amrut Whisky 40% A hint of something different, most people said it smelt savoury. Was a quick smell, not very forthcoming. Not too much to write home about from my notes. It’s an average whisky. 4. Amrut Fusion Smelt very strongly of Garden Centre to me. A huge hit of fruit, with citrus and spicy notes. The finish was hugely characterful, to me it was a quick crescendo but it came back with reverb. Some said it was oily and salty. 5. Amrut Peated 46% Very powerful smell, characterful. Was met with a sounds of approval from the rest of the room. A very peated taste which to most in this group was nectar. Ticked all the boxes. It wasn’t as well rounded as many peated whiskys I’ve tasted, but it was all the more distinctive because of that, and therefore more interesting. 6. Bowmore 12. Fruity, spicy, slightly peaty. 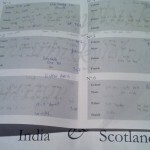 I correctly spotted the three Amrut whiskies as they went past during the evening, and was very close to the Bowmore and the Highland Park (Island style whiskys can be hard to split out from Speysides), but then the three Indian expressions are very distinct and I only had three to choose from. Likewise, I know what the shape of a Scottish Single Malt taste is like so spotting ones that were obviously out of kilter was easy. To be fair, I also bought a bottle of Amrut Fusion the other weekend, just before it was awarded number 3 in the world by Jim Murray (which caused supplies to dry right up), so I’d hoped I’d at least spot that one. The surprise finish was a small sample of Amrut Peated Cask Strength as an unprecented whisky number 7. This totally demolished the competition and, unfortunately, nearly demolished me too. By this time, my lift home was parked outside and was pointedly looking at its watch, so I sadly made my excuses and left before I made a greater fool of myself. I’m normally fairly sensible (boring?) when I go out drinking, no more than 3 pints of an evening as a rule, but I do sometimes get hugely over excited when in a friendly crowd and the alcohol’s been flying and there’s a shared topic of conversation you can really get your teeth into. Sadly, there’ve been times in the past when that’s led to an embarrasingly crippling hangover the morning afterwards (I’m thinking Stevenage here..) so I clearly need to take more advice from Yoda. Control, I must learn Control. Another thing that has been clear for a long while and was reinforced this evening, in case it isn’t bleedin obvious by my collection, I do like an interesting peated single malt. Apparently a sherry finished Connemara has just been released, which is well worth watching out for. This entry was posted in Food on October 27, 2009 by Dav Stott.